Even though most of the episodes this season are easily forgettable the addition of such guest voices as Kenny Loggins and Christian Slater are nice breaks from what seems to be one of the worst season of Archer made to date. A couple of years ago 20th Century Fox launched a new satirical spy drama on their FX channel called Archer. The show caught on due to its tongue-in-cheek off-the-wall humor, it's distinctive style of animation, and the fact that adult audiences found the show good enough to wind down to after a days work. For four seasons Archer pretty much kept the same format and show that it started with back in season one. Sterling Archer and team are part of a dysfunctional private spy agency name ISIS (Which the show creators are probably shooting themselves in the foot for given the headlines of today's news). Their missions end up border lining on the ridiculous, but they still end up coming-out on top. 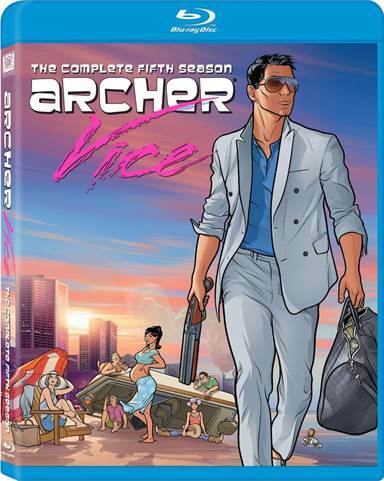 To switch things up this year, Archer's creators came up with "Archer Vice". During the opening scene of this season the ISIS office comes under attack by the FBI, leaving the ISIS team/family without their spy toys, missions, and money. Thanks the seemingly unlimited wealth of ISIS employee Cheryl Tunt (Judy Greer) the group heads down to Miami to live in one of her mansions. It is down in Miami the former members of ISIS turn to selling cocaine (when Pam Poovey (Amber Nash) isn't trying to snort, eat, and lick it all up), trying to get Cheryl a record deal for her country singing career, and selling arms to South America, all in the name of making the all-mighty dollar. This dramatic shift in plot lines was going to either win over viewers that were bored with the show or upset viewers that enjoyed the show's past story lines. I unfortunately fell into the later case. While Archer has always had some ridiculous story lines (robot villains and space come to mind), most of the shows episodes where well thought out, funny, and could easily enjoy repeat-viewings. This new story line drafted by the creators tries for huge laughs with episodes that leave this reviewer scratching head. At the end of each episode I'm trying to figure out what the purpose of creating it. The pristine AVC encoded video of Archer: The Complete Season Five is one of the strongest selling points for this Blu-ray. The picture has perfect blacks and the color pallet shines through brightly. This all helps to enhance one the main selling points of the series, the rotoscope animation used throughout the show. The lossless DTS-HD Master Audio 5.1 is a bit on the dull side for this release. The rear channels seem to get lost in the mix, and do not add much to the action scenes shown throughout the season. As usual with other Archer Blu-ray releases the special features found on this Archer Blu-ray release are sub-par. Other than adding a possible chuckle they do not add any quality or in-depth look at the show or it's creators. The special features on this release include, Pam Poovey singing her version of "Old MacDonald Had a Farm", Cherlene Tunt's "Midnight Blues" music video, and a Cherlene Tunt Interview on Wake Up Country. Archer: The Complete Season Five is a difficult one to recommend. If you enjoyed the show, but it got stale for you, then this season is highly recommend. If you are a fan of Archer but enjoyed it's former format you will probably be disappointed, and if you are just getting into the show now – well you should probably watch another season. Thankfully it looks like Archer Season 6 will the show back on its tracks. Download Archer: The Complete Season Five from the iTunes Store in Digial HD.